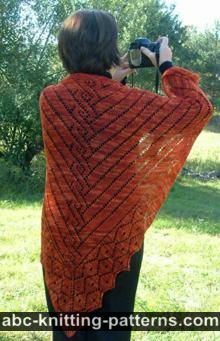 The shawl is worked from the center out with a knitted-on border. 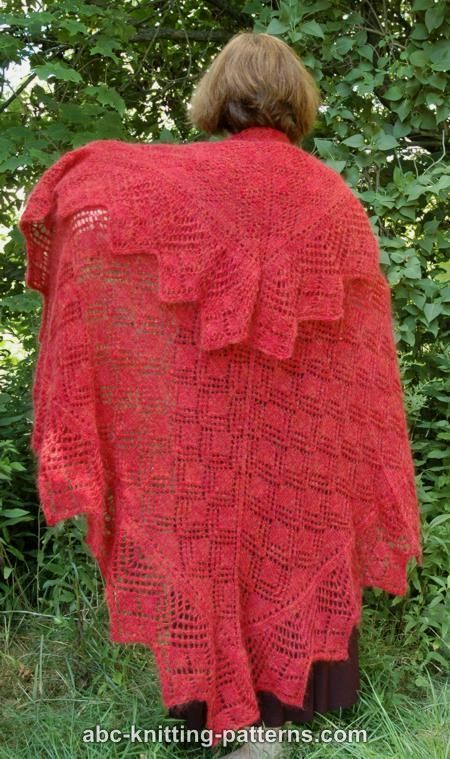 It is worked with 2 strands of yarn: lace weight wool and lace weight mohair. FINISHED MEASUREMENTS: 72" (182 cm) square. Needles: US 6 (4.0 mm) circular and double-pointed needles and US 4 (3.5 mm) double-pointed needles. 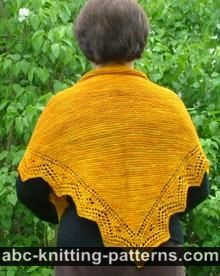 The square shawl is worked from the center to the outer edge in rounds, with the increases at 4 corners. 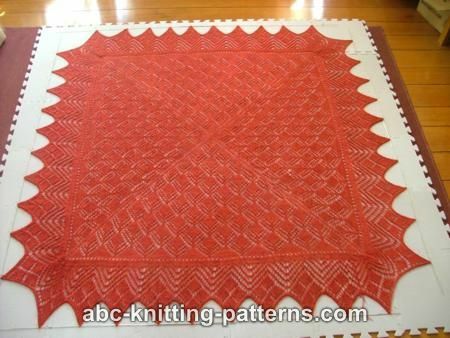 Then the knitted-on diamond border is worked along the edge of the shawl. Make a circle of yarn. Pass the hook through the loop, grab the yarn and pull it through the loop. 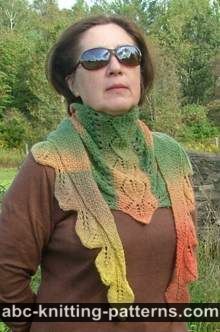 Grab the yarn again and pull it through the stitch on the hook. You made the first sc and the 1st cast-on st. Repeat the procedure to cast on 12 sts. Transfer every 3 sts to a dpn (4 dpns). 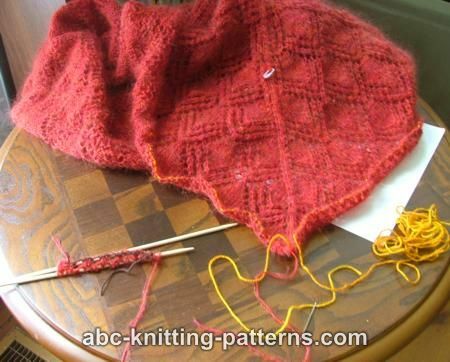 Pull the hanging tail of the yarn to close the loop. 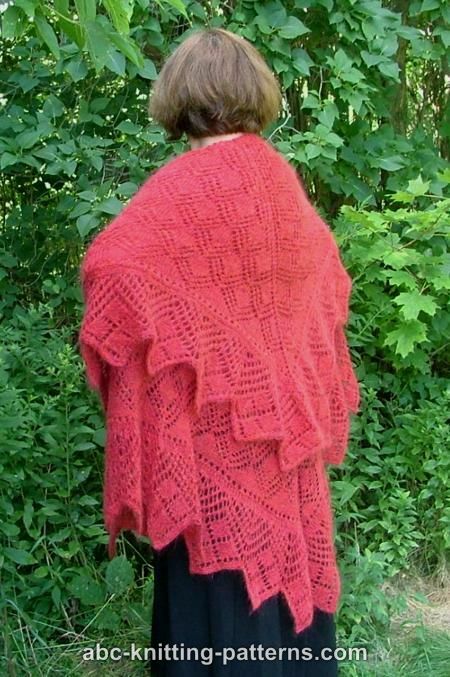 Now you are ready to work the 1st round of the shawl. 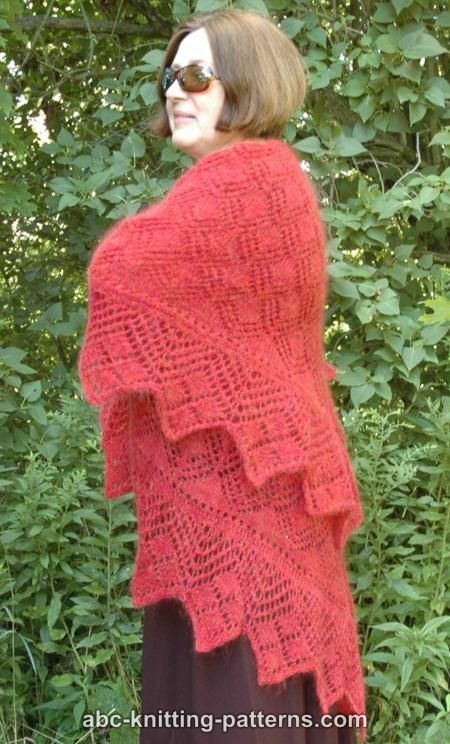 Please note that the shawl consists of 4 similar quarters. 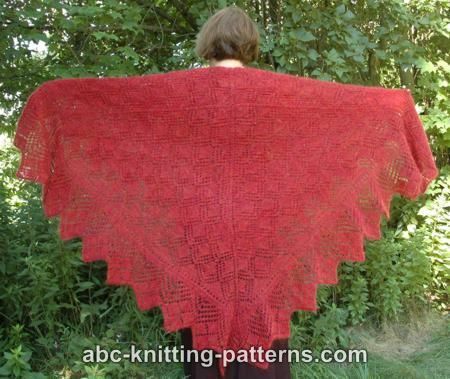 The chart below is for 1/4 of the shawl. You have to repeat each round instructions 4 times. The chart as well as written instructions are for odd rounds only. All even rounds are knit. 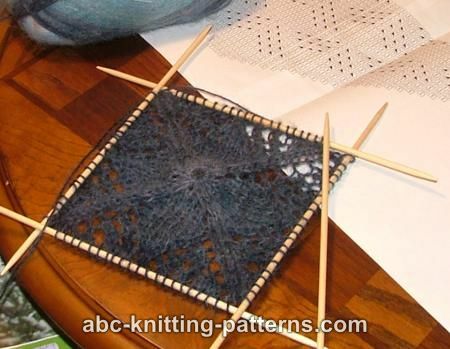 To shape the shawl square in each odd round there are 8 yarn over increases (one increase at the beginning and one increase at the end of the quarter). The increases are in the chart as well as in the written instructions. 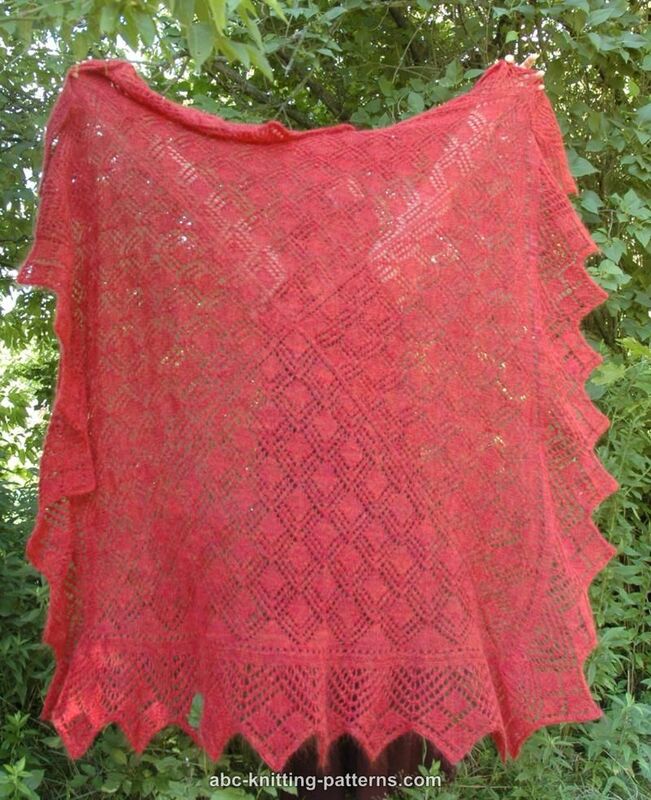 Shawl chart is available as .PNG and .PDF files. Row 149: *k2tog, yo*, repeat to the end of the round. 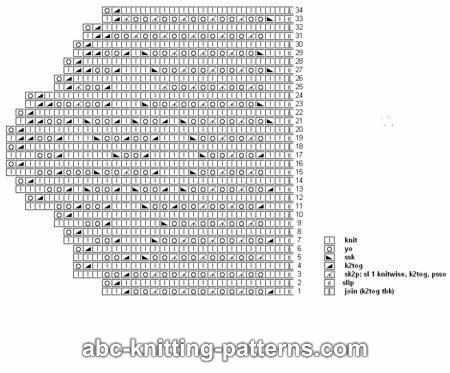 Transfer all the sts to a length of yarn. border for 1 st of the shawl (in the 4th row k2tog tbl; the same st as in the prevous join row). Triple join - work 6 rows of the border for 1 st of the shawl (in the 4th and 6th rows k2tog tbl; the same st as in the 2nd join row). 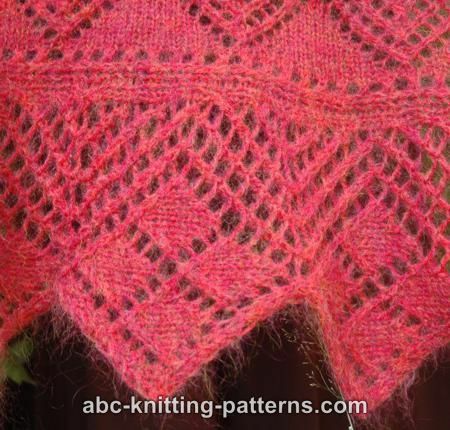 Cast on 20 st with the single cast on and continue to work the border on #4 needles. Start the first join from the 4th st from any corner. Work 9th repeat: 1 single join, 8 double joins. Work 10th repeat: 3 triple joins: on next side of the corner 2 triple joins and 1 double join. Row 1: sl1, k1, k2tog, *dyo (double yarn over), sk2p*, from * repeat 4 times, dyo, k2tog, k2. Row 2 and all even rows: yo, k2tog, knit to the end of the row, knit the last st together with the 1 st of the center panel k2tog tbl (knit 2 tog through back loop) - this is the single join. Row 3: sl1, k2, *dyo, sk2p*, from * repeat 4 times, dyo, k2tog, dyo, k3. Row 5: sl1, k2, *sk2p, dyo*, from * repeat 4 times, ssk, k1, k2tog, dyo, k3. Row 7: sl1, k1, k2tog, *dyo, sk2p*, from * repeat 3 times, dyo, ssk, k3, k2tog, dyo, k3. Row 9: sl1, k2, yo, *sk2p, dyo*, from * repeat 3 times, ssk, k5, k2tog, dyo, k3. Row 11: sl1, k2, k2tog, *dyo, sk2p*, repeat from * 2 times, dyo, k2tog, dyo, ssk, k3, k2tog, dyo, k2tog, dyo, k3. 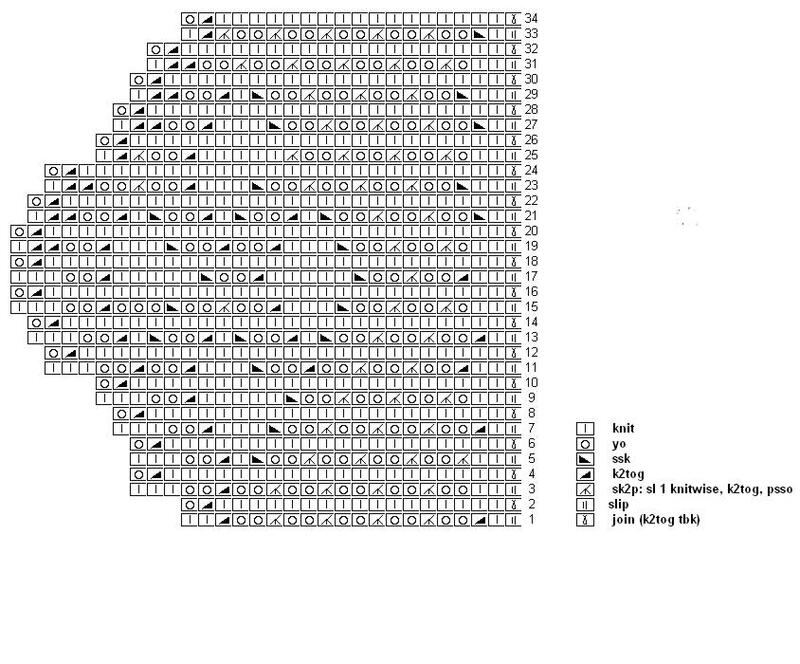 Row 13: sl1, k1, *dyo, sk2p*, from * repeat 2 times, **dyo, ssk, k1, k2tog**, from ** repeat 3 times, dyo, k3. Row 15: sl1, k2, yo, *sk2p, dyo*, from * repeat 2 times, ssk, k3, k2tog, dyo, sk2p, dyo, ssk, k3, k2tog, dyo, k3. Row 17: sl1, k2, k2tog, dyo, sk2p, dyo, ssk, k5, k2tog, dyo, sk2p, k5, k2tog, dyo, k3. Row 19: sl1, k2, yo, *sk2p, dyo*, repeat from * 2 times, ssk, k3, k2tog, dyo, k2tog, dyo, ssk, k3, k2tog, dyo, k2tog, k2tog, k1. Row 21: sl1, k1, ssk, dyo, *sk2p, dyo*, repeat from * 2 times, **ssk, k1, k2tog, dyo**, repeat from ** 3 times, k2tog, k2tog, k1. Row 23: sl1, k2, ssk, *dyo, sk2p*, repeat from * 3 times, dyo, ssk, k3, k2tog, dyo, sk2p, dyo, k2tog, k2tog, k1. Row 25: sl1, k2, yo, *sk2p, dyo*, repeat from * 3 times, sk2p, k5, k2tog, dyo, sk2p, k2tog, k1. Row 27: sl1, k1, ssk, *dyo, sk2p*, repeat from * 3 times, dyo, ssk, k3, k2tog, dyo, k2tog, k2tog, k1. Row 29: sl1, k2, ssk, *dyo, sk2p*, repeat from * 3 times, dyo, ssk, k1, k2tog, dyo, k2tog, k2tog, k1. Row 31: sl1, k2, yo, *sk2p, dyo*, repeat from * 5 times, k2tog, k2tog, k1. Row 33: sl1, k1, ssk, *dyo, sk2p*, repeat from * 5 times, k2tog, k1. Graft the beginning and the end of the border. Weave in all ends. Block.